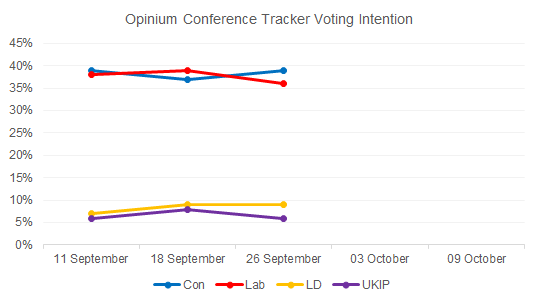 Opinium’s weekly Conference Tracker will monitor voters’ views during the party conference season. They are not guaranteed to either radically change the political weather or bring us a ground breaking policy, but it is the most concentrated media coverage that the major parties and their leaders will receive over the course of the year. It’s for this reason that with The Observer we will be taking a weekly look at the political state of play and how it changes – if at all – over the course of September and October. The Conservatives went into conference season with a 1-point lead in the polls. As their conference they should get a bounce far later on in the season, but initially they’ve lost ground as the Lib Dems and UKIP gained in the polls. However, the Conservatives regained the lead after the Labour Conference. It appears the concentration on Labour’s Brexit policy division satisfied few. Labour lost ground amongst Remainers, while it galvanized Leavers to say they would turn out for the Conservatives. However, the problems of presenting policy to a divided party and a divided country will now be for the Tories to navigate. Theresa May goes into conference season with a lead on who would be the best prime minister. At this stage neither have been the focus of attention, although this will change after this weekend as the Labour Party conference kicks off. In recent months voters have been more likely to select ‘none of these’ than either of the main party leaders. 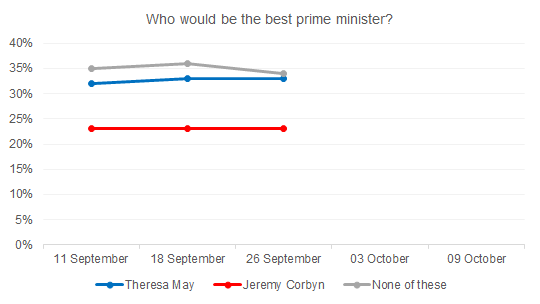 While conferee season has not yet seen a big change in party leader preference, if the Conservative conference goes well for Mrs May it could find the prime minister regaining some of those who think neither her or Jeremy Corbyn would make the best prime minister. 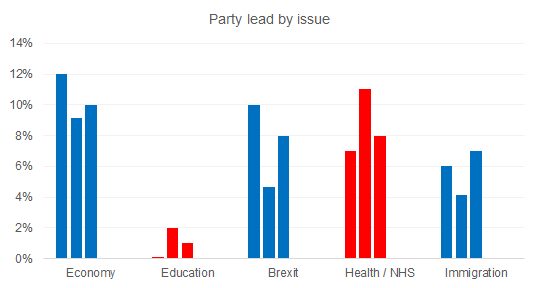 We’ll also be tracking what the most important issues are, and seeing if the issues the parties choose lead on at conference makes a change in the voters’ focus. 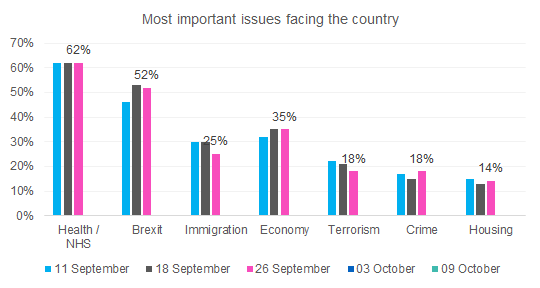 So far it’s seen Brexit increase in salience, while immigration has dropped slightly. Since June the economy has been clearly back in the top three issues, and the conference season appears to have confirmed that, but before June it frequently fell down to fourth or fifth place. Then we’ll also track how the parties perform on the key issues. Before Conference season the Conservatives started of well, with a 12-point lead on the economy and a 10-point lead on Brexit. In the run up to Labour’s conference they appeared to suffer a big set back on the policy front. This was especially the case for Brexit, with their lead dropping to just over 4-points. It’s only since the Labour Conference that they regained a stronger lead on Brexit (8-points). Ultimately, both parties have lost a small amount of ground on their strongest policy areas. The only exception is that the Tories have a stronger lead on immigration in the run up to their conference than they did earlier on in September (rising very slightly from 6-points to 7-points).